Hurry! 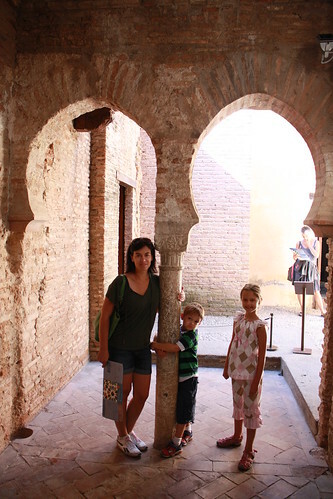 I have to finish the trip recap because other things are happening, like the 6th anniversary of when my tiny infant baby boy exited my womb, and if I don't blog while the memory is fresh I shall forget entirely. His birthday, not his exit. That I remember vividly. Especially the part after he was born when there were about ten people waltzing here and there around the room and no one had thought to pull the sheet back down over my knees. I couldn't do it myself because the beautiful, wonderful epidural had rendered me motionless. Just airing things out, I guess. But that doesn't really have a lot to do with our trip, now does it? We left off with us leaving Ronda and heading toward Granada. We were going for "flexible"on this trip, so we waited until we were sure we were ready to move on from the beach before booking our hotel in Granada. We randomly picked a place and got lucky. This was our view from our corner room, which ended up being a suite with separate bedrooms. That little detail made my husband a happy man. I shall not expound on that. 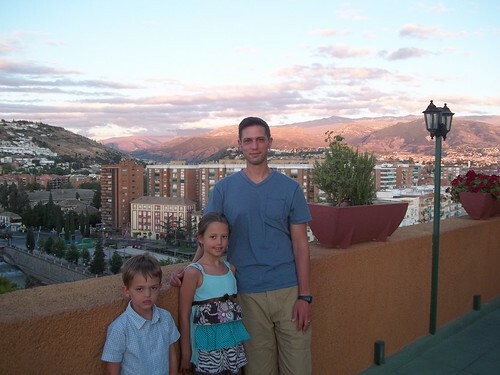 The hotel had a rooftop terrace and pool with great views. 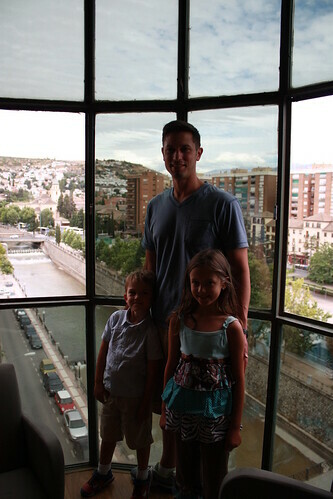 After we dropped off our bags, we headed out to see the city and find some tapas. Sangria and a load off. It had been a long day of driving and sightseeing on the way over. 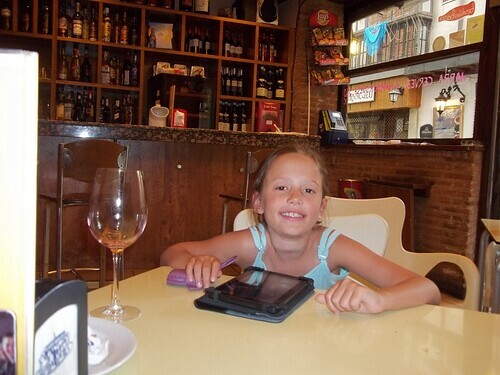 The key to taking children with you while tapas-hopping is bringing electronic babysitters. 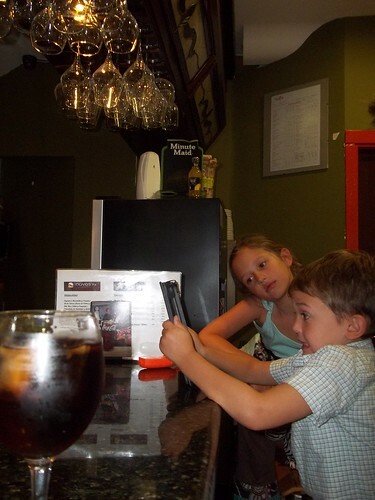 Then we took it up a notch from kids in a bar to kids at the bar. I think Derek just had a strong shot. 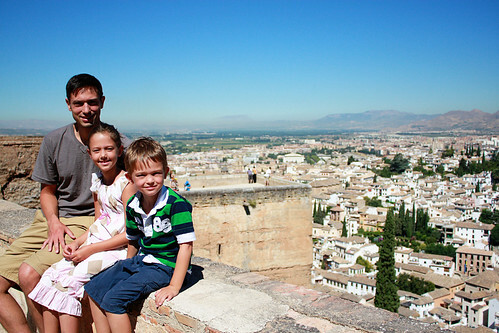 After a night's rest, we headed to see the Alhambra, which is the most-toured attraction in Spain. 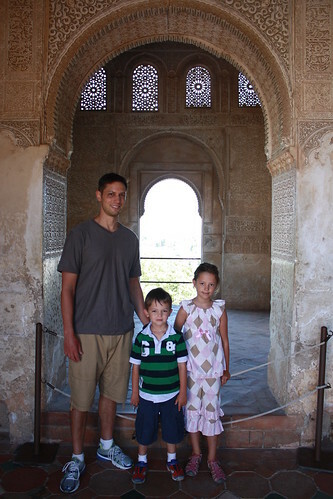 Click the link for the wiki history lesson or take my word that the Alhambra is an old Muslim palace/fortress with incredible gardens and preserved buildings. We took the sting out of "grown-up" touring by choosing the hop-on-hop-off bus as our means of transport. 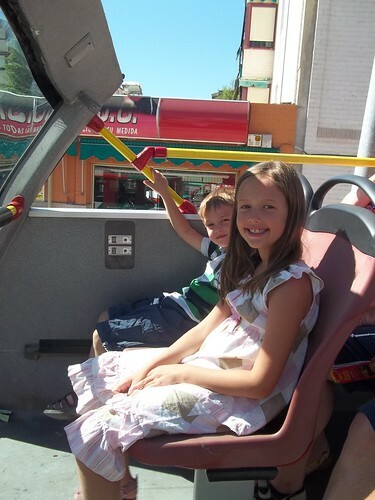 The kids have been drooling to get on the top of one of those buses ever since we arrived in Madrid. I jest. But we do have a cool street. 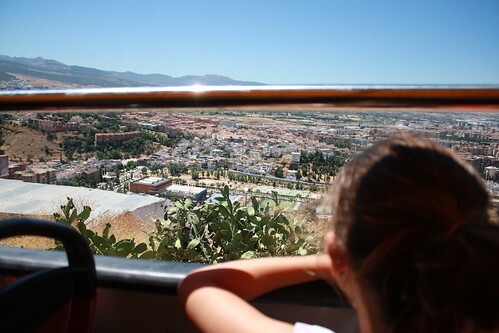 So we took the bus up the mountain to the Alhambra. Later that day we would read that a tour bus in Italy crashed into a deep ravine and I would be grateful for safety and also that I read that after our trip up the windy roads. 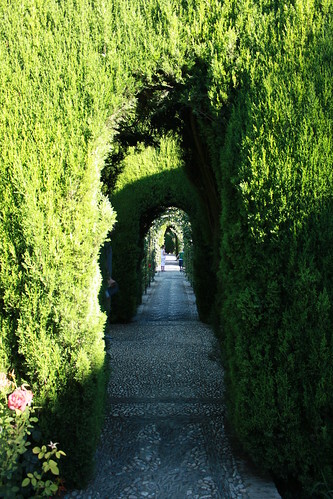 I can't do justice to the gardens there, so I wont even try. The kids liked to run and hide along the paths. Taking the bus around town. Followed by more sangria and tapas. 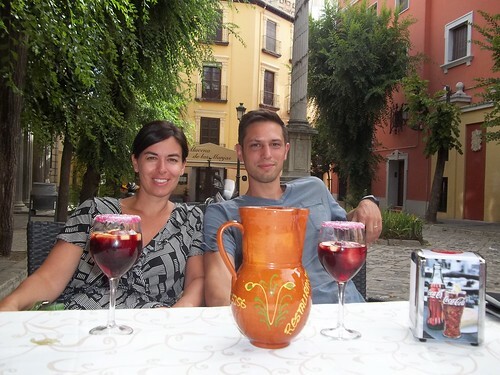 Spaniards consider sangria a tourist drink. We're okay with that. Here in Madrid we know of a couple restaurants where we can eat dinner as early as 8:30, so occasionally we do that. Most of the time, if we're going to eat out we'll do the big mid-day meal and stay home for dinner. But tapas are fun now and then as well. The next day we got up and headed back home. It was about a 4 hour drive home, and once we walked in the door it was about 40 minutes until Josh had all the suitcases unpacked and back in the closets. He's the yin to my yang. The butter to my toast. The only one of us with motivation for such trivial nonsense like unpacking. And it was about 4 days later that I was finally caught up with all the laundry. I will say that clothes hang dry a lot faster in August than they do in February. That's my glass-half-full comment for not having a dryer. So much fun! 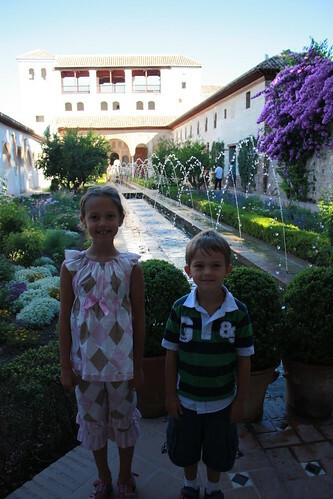 It's great that your kids are old enough to be entertained by the electronic babysitter :) And that they love to run around the gardens! And who cares that the sangria is a tourist drink, it's still better than what you get in the States! 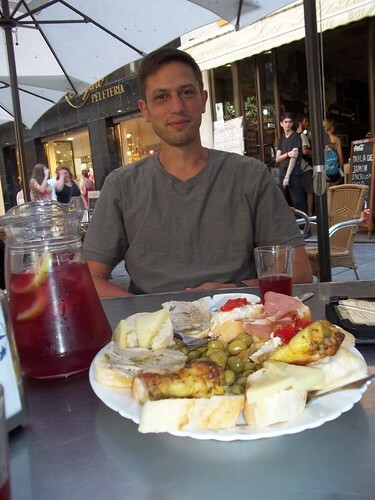 Crepes, gelato, sangria, and so many other dishes are sooooooooo much better when tasted in their country of origin.